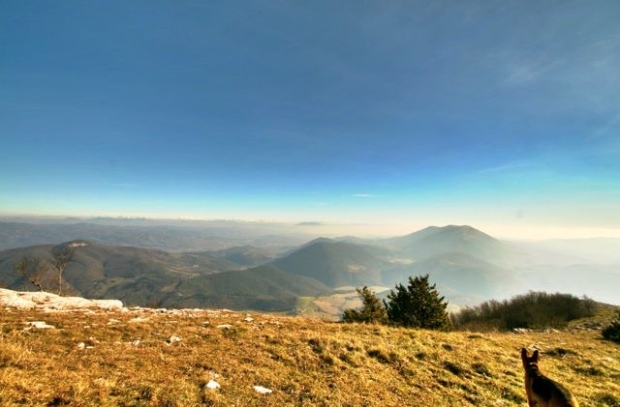 The first day of 2014 was bright and sunny – a perfect winter day for a walk up Monte Acuto, a mountain near our house on the Tuscany Umbria border. 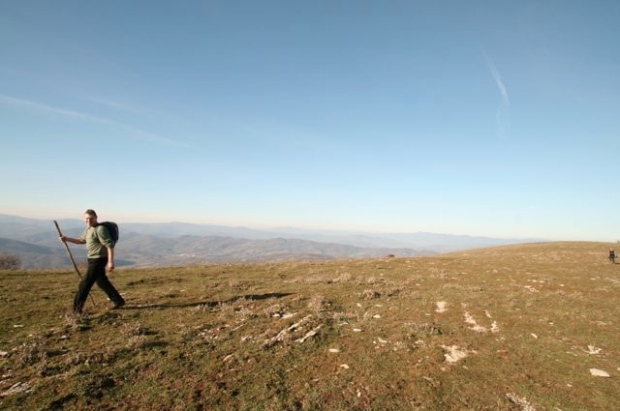 Monte Acuto’s distinctive pointed shape is responsible for the mountain’s name; it’s height and shape make it visible from miles around and many people must have thought about walking to the summit, even if they didn’t put their thoughts into action. 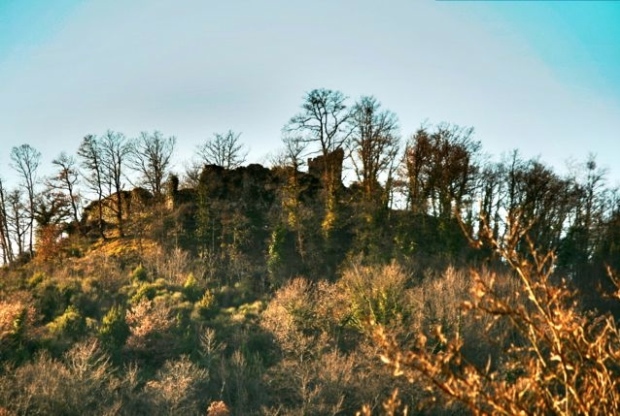 The urge to climb this mountain is not new, the Etruscans built a temple at the top and prehistoric people built a fort about half way up. Unlike the modern visitor who climbs Monte Acuto in order to enjoy spectacular views, the Etruscans were probably more interested in sun and deity worship and the prehistoric people in the defensive position of their fort. The walk starts with a stiff climb through a planted pine forest pine forest. After about 20 minutes, just as the pines give way to oak trees, you come across the remains of the prehistoric fort. 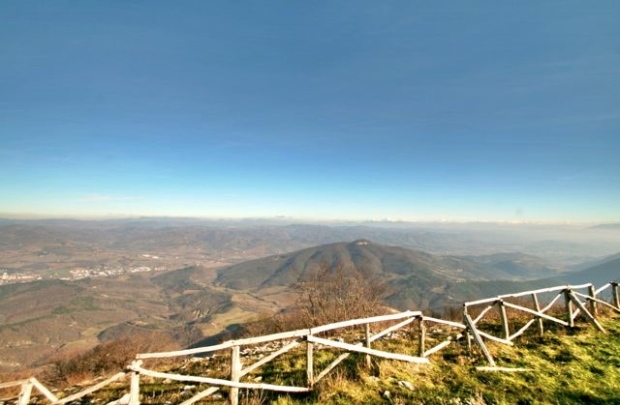 From here you get the first good views onto the Upper Tiber Valley and the Appenine mountains. 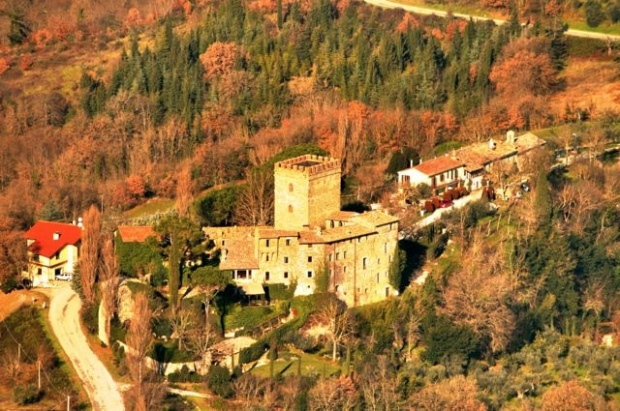 I could pick out Migianella, the Sant’Anna Antennae, Umbertide and several castles including Polgeto, which we had driven past on the way to the start of the walk. As we climbed from the hill fort the oaks became thinner and the trees petered out after a few minutes. The path became narrower and eventually undefined – other than the occasional red and white marker. At this point it doesn’t really matter, it is obvious that if you want to get to the top you have to keep climbing! Eventually we reached the summit, because it is still the Christmas period the large metal cross at the summit had blue neon lights attached. I had always imagined that they were turned off in the day, but, now that we were up close I could see they were on. The effect gave an impression of a piece of modern installation art that you might come across in a Sculpture Garden. 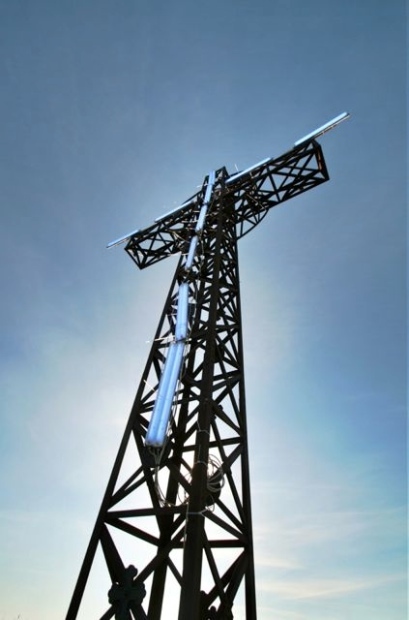 The cross was erected by the people of Umbertide in 1933 to remember the soldiers killed in the First World War. 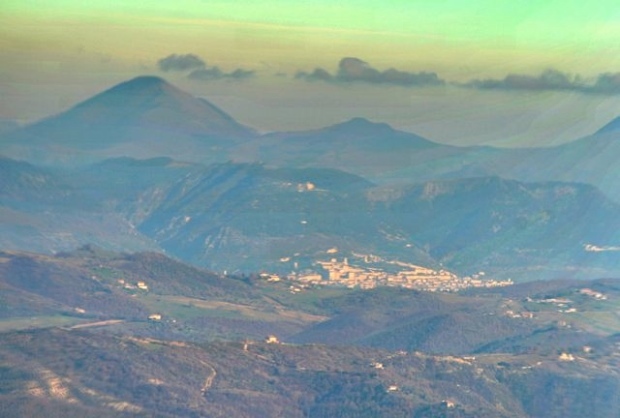 From here the hills to the south became visible including nearby Monte Tezio and Monte Subasio behind Assisi. In the distance were the snow capped Appenines and, for the first time in several walks to the top of Monte Acuto, I could clearly see the town of Gubbio to the east. It was surprisingly still up on the summit although noticeably cooler, especially as we stopped for several minutes to admire the view. Then we began the long descent down the other side the mountain, strangely, we came across a couple of butterflies that must have been fooled into waking up early by the sunshine. Once at the bottom of the descent, the route goes around the side of the mountain back towards the starting point. 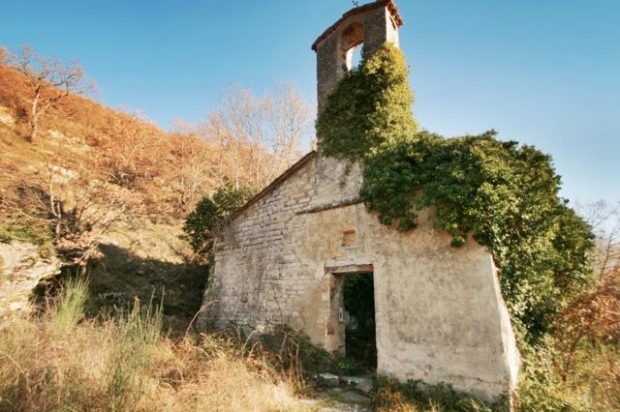 Deep in the woods along the path you pass the ruined church of the Madonna della Costa. At first you wonder who would have used the church, but a few minutes further on you pass several houses. In the alcove at the back of the church there used to be a large wooden statue, the Madonna della Costa (Madonna of the Slope). This statue had been there since around the year 1200., as the hillside community abandoned the houses in the 1950’s and 60’s, the church fell into disrepair and the Madonna was moved to Perugia. The first two houses along the track have been restored but there are also several overgrown ruins further along. Across the ravine to the left we could see the ruined castle of Monestevole, normally, it’s hard to see as it is overgrown by trees, however, without their foliage the shape of the castle was clearly visible. From here, it’s not far to the starting point and back the end of the walk. 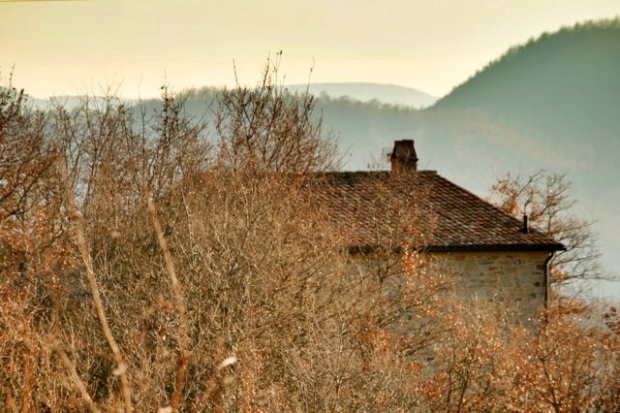 You can find instructions for the Monte Acuto walk in my e-book, Circular Walks On The Tuscany Umbria Border (by Martin Daykin), available for download from Amazon.